« Will You Swim Better (and learn faster) with a Smile? In my last personal history installment of this series on stroke drills, I described three life-changing insights that have shaped my view of stroke drills, and how we use them in the Total Immersion Method. Introduction to my first balance drill by Bill Boomer. In less than 10 minutes, I was freed from a thought I’d held for 30+ years: That I had ‘heavy legs’ and there was little I could do about that. I realized the transformative power of doing the right drills in the right way. I was also set on the path to Kaizen. While I had thought my development as a swimmer was long-finished, I realized there was a lot yet to be learned. Twemty-seven years later, I’m still learning. New swimmers need new drills. The traditional drills I’d used with solid results for nearly 20 years with young competitive swimmers–all of whom had swum nearly out of the cradle–were virtually useless for late-starting adults. They left our students feeling tired and discouraged. We needed to find an all-new menu of stroke drills to address their primal concerns — fear of sinking and choking. Only after making them comfortable in the water, could we teach skills. Vessel-Shaping is ‘aquatic magic.’ When we began teaching drills that address how the human body naturally behaves in water, the progress we saw was stunning–even to coaches with decades of experience. 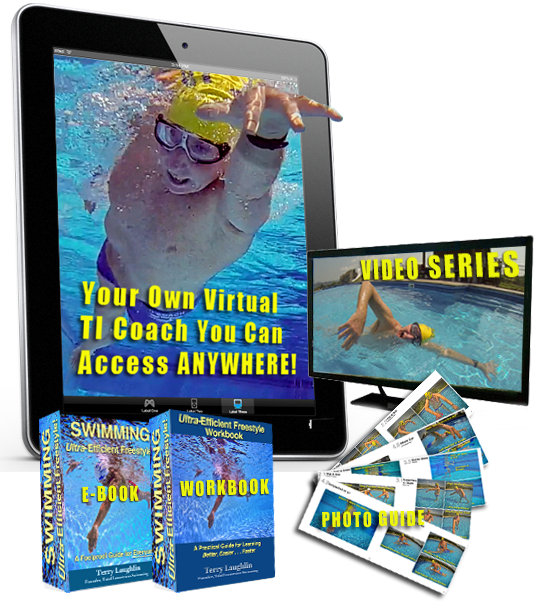 And not just for beginners, but for experienced swimmers too. Ever since, TI coaches and drills have focused on balancing, extending, aligning, and stabilizing the core body before any focus on using the arms and legs for propulsion. In the 20+ years since gaining those insights, our countless instructional experiences (involving 100s of TI coaches and 1000s of swimmers) have produced three further major insights into how to maximize the value of stroke drills–and the transfer of skill from drill to whole-stroke. 1) Use Stroke Drills to Make Mindfulness a Habit. The swim-team workouts I did from age 14 to 20 developed, in me, a habit of mindless or ‘autopilot’ swimming –as does the experience of ‘going in circles’ to nearly any swimmer. Learning my first balance drill–and being instructed to pay close attention to head-spine alignment–began a shift toward never taking a stroke in vain. I take every stroke with clear and purposeful focus. I began taking yoga classes at the same time I began teaching novice adults, and couldn’t help but be influenced by my experience in them. Yogis seldom count sun salutations or warrior poses but they always focus on the moment-by-moment details of each. It occurred to me to dissect the freestyle stroke into a series of critical positions or moments–like yoga poses. We devised a drill, or Focal Point, for each moment, practiced them with yoga-like attention, which created far more granular awareness of the whole stroke. Ever since, drills (and, in recent years, rehearsals) have been a primary means by which we help swimmers develop the habit of swimming with clear and specific focus. In fact, as we begin instruction with new students, we ask them to assess both quality of movement; and quality of attention at the conclusion of each repeat. In the early days of TI we reflexively instructed swimmers to complete 25y/m lengths of each drill, then we’d greet them at the other end of the pool with feedback and further instruction. The act of simply giving feedback and correcting errors on every lap made the TI approach to drills rather unusual. In countless instances I’ve personally observed swimmers repeating lap after lap–imprinting what are quite obviously poor movement habits–with no correction. After 10 seconds or so, the swimmer’s objective shifted from improving a skill to simply reaching the other end. Physical, mental or neural fatigue. Because the movements being practiced were new–as was the demanding amount of focus–drilling for a full length (sometimes taking 45 to 60 seconds) simply exceeded their capacity for keen attention . . . and the still-faint neural imprint of the new skill. Thus we redesigned the majority of our drills to be performed for just six to eight meters or 10 seconds or less–and repeated 4 to 8 times. The moment you feel your kick become labored, or the drill has become a kicking exercise, STOP–wherever you are in the pool–for a breather and mental reset. Breathing is an extremely common ‘failure point’ for newer or less-skilled swimmers. It is also a quite distinct skill from those of position, movement, and timing (P, M, & T). Thus, we teach P, M, & T first and quite thoroughly, before introducing breathing drills and skills. When a swimmer is comfortable, in control, and feeling supported in the water, it becomes far easier to learn breathing skills. You will find all these principles and approaches explained and employed in our latest and most advanced tool for personal improvement–the Ultra Efficient Self-Coaching Toolkit. Terry – you are so spot on! It’s been years since the Costa Rica workshop where you taught us TI. At this time I’m working on TI swimming (and really enjoying it), Iyengar Yoga, and Chi Running. All disciplines have the same principles – good form, focus, and constant improvement. Thanks for your comments and suggestions! Do not learn to swim until old age, and learn to death.